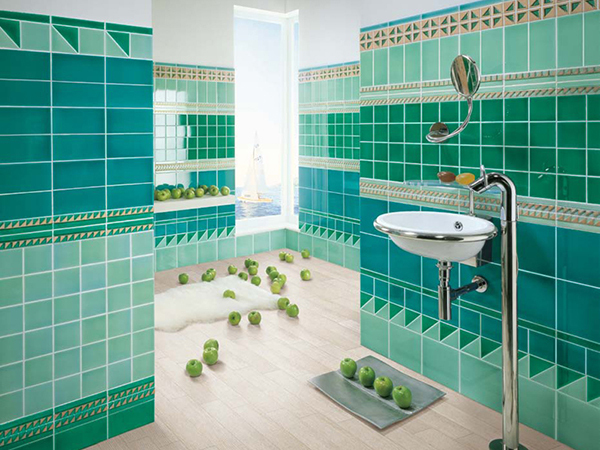 Tile can serve many functions in the bathroom. They can make distinctions between certain spaces, add design, add interest, and add color. 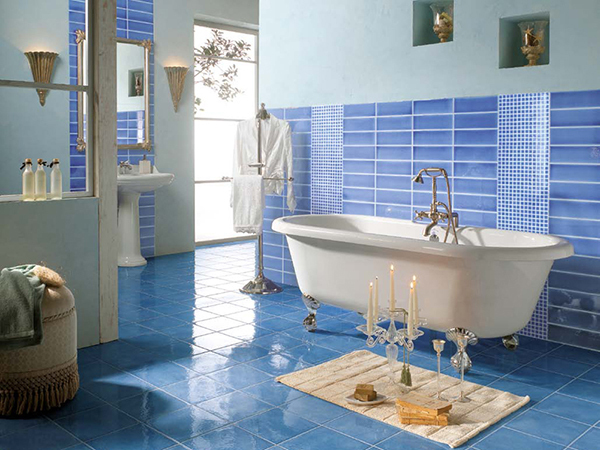 The following bathroom tile ideas showcase some fantastic examples of utilizing tile to decorate your bathroom. 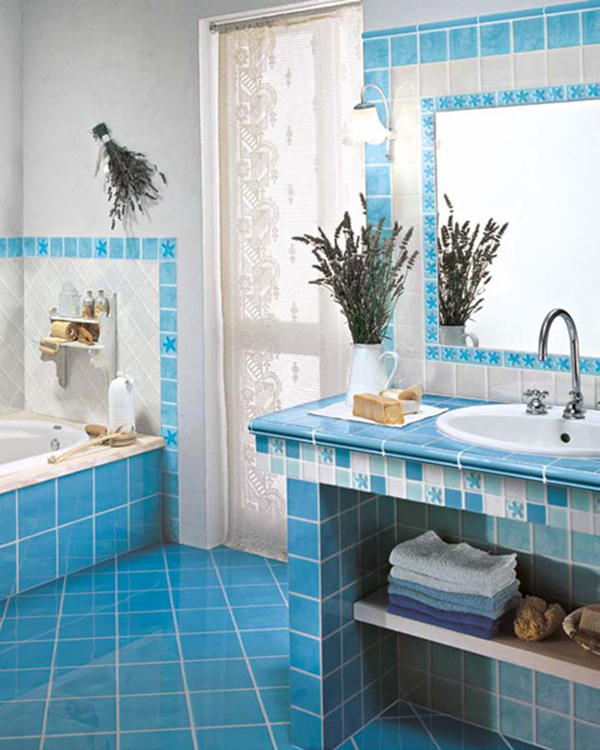 Bright blue tile runs throughout this room, using variation in shape and size, to create interest. This tile is placed only on the wall. The greens and geometric shapes are gorgeous. 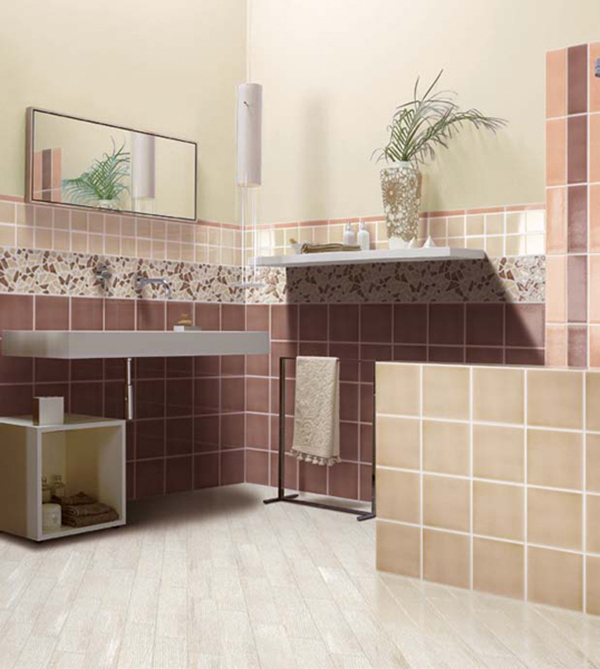 We also like how the light brown tile adds variety to the color palette and complements the hardwoods. 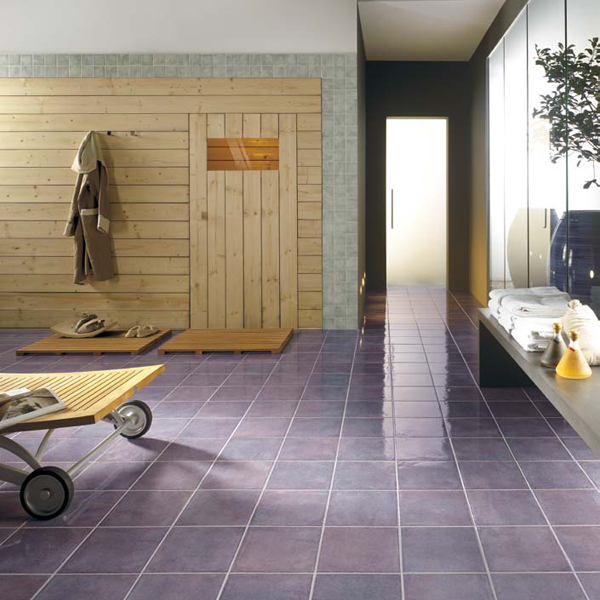 Unified purple tile lines the floor and wall of this bright bathroom. 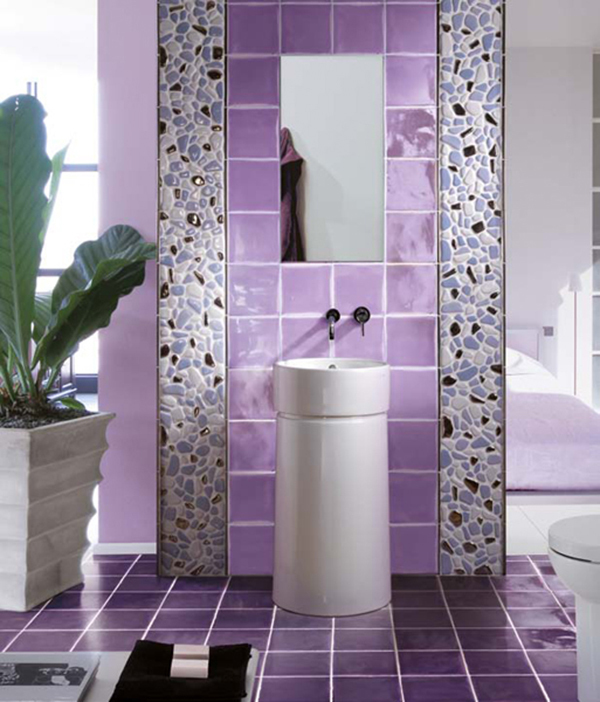 Small tiles frame the mirror, contrasting the large purple tiles. 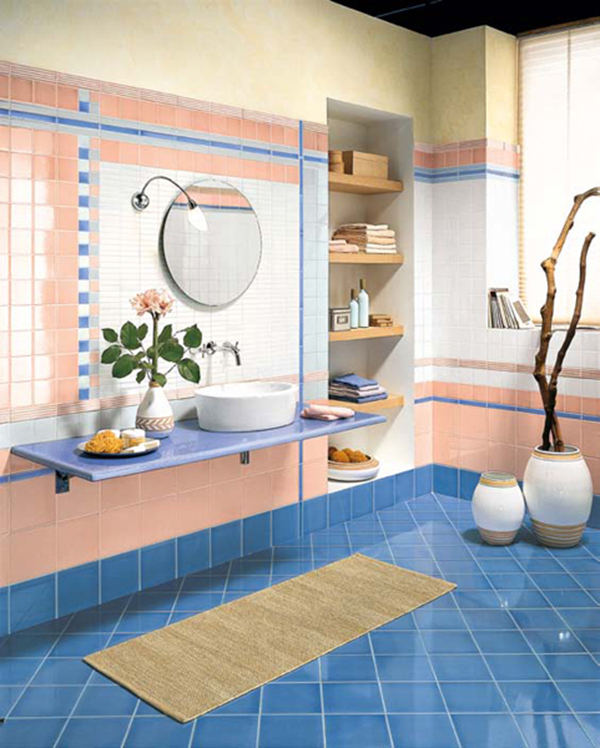 Peach, blue, white, and gray brighten this bathroom space. The small white tile above the sink creates a separation in the space, effectively dividing the sink from the rest of the bathroom. The color of the tile divides this bathroom into sections. 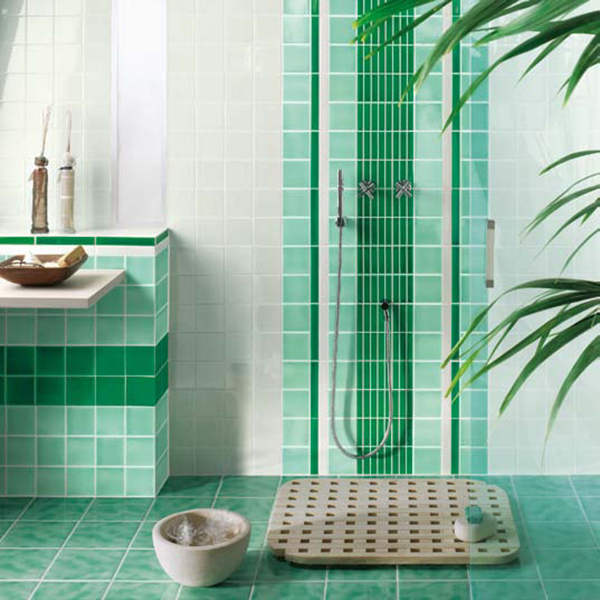 The green distinguishes the shower, the gold is for the wall, and the brown separates the floor. Multiple colors are used for the built-in storage. 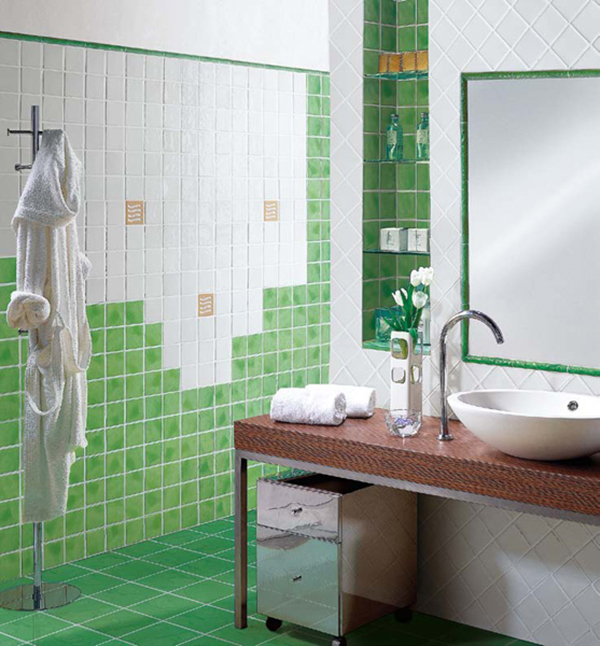 We love the bright colors used in this bathroom. The tile framing the sink is also interesting, bringing to mind, the mantle of a fireplace. 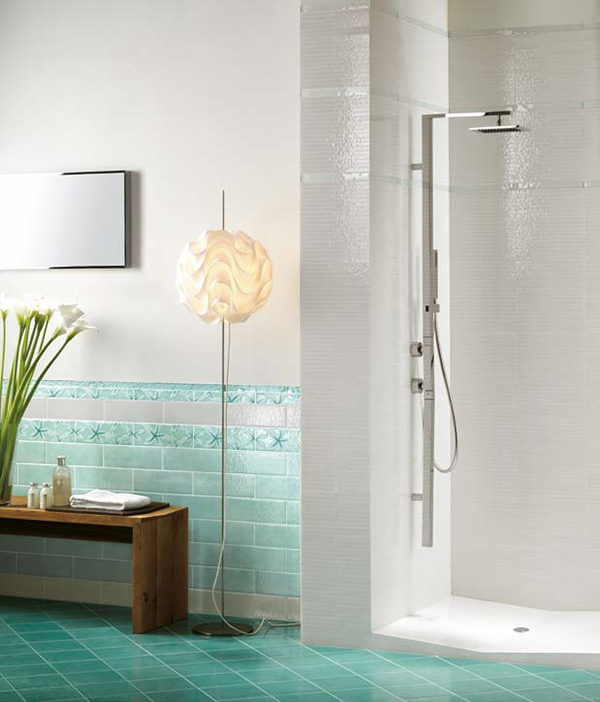 Tile can also have a modern and sleek aesthetic. The clean-lines and color palette of this bathroom create a lively and enticing atmosphere. Consistent shape and color add a modern elegance to this bathroom. 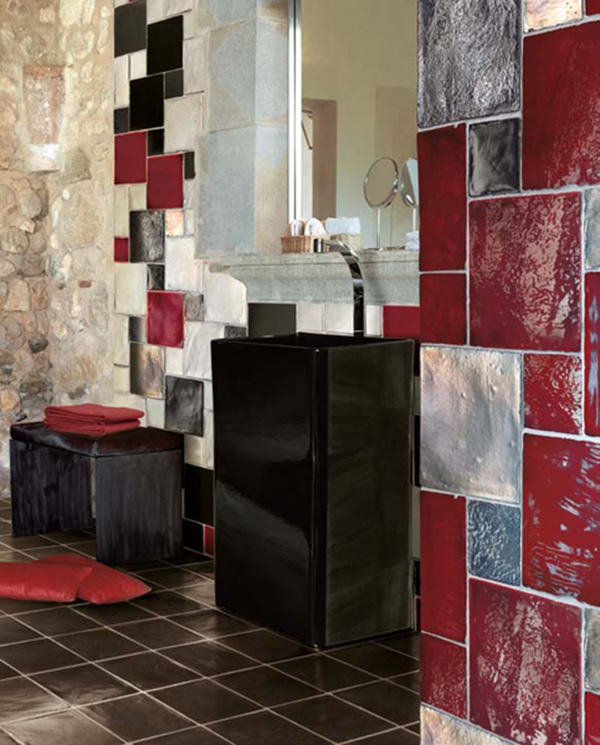 Bold colors and texture add interest to this unique bathroom. 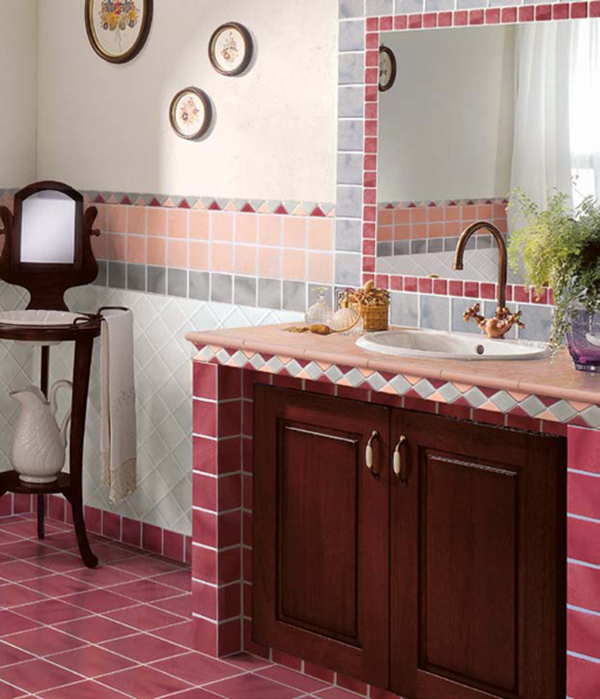 This bathroom has muted colors and tiled walls. The contrast between the tile and the wood is absolutely gorgeous. 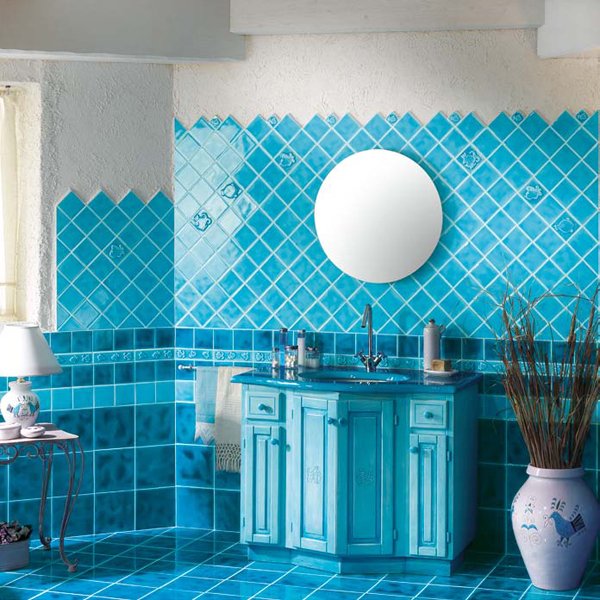 Here we see the fascinating sink tile again, but this time it is in a bright blue color. 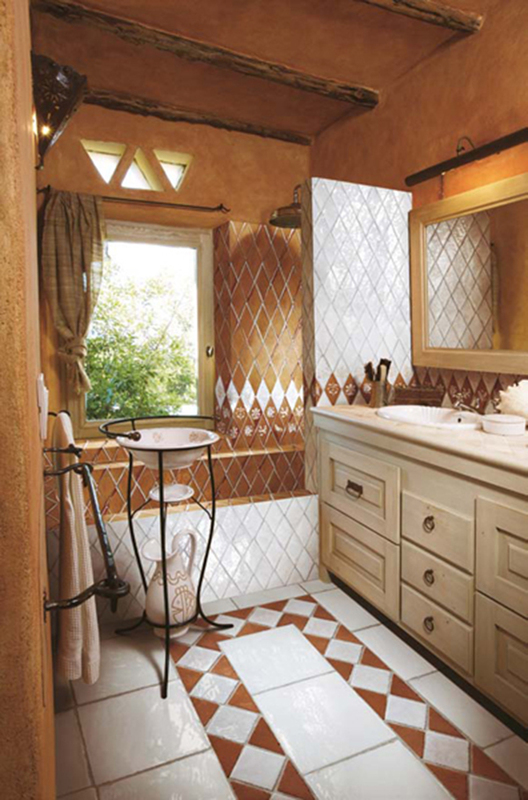 Excitement is created through the use of patterns and various tile sizes. We love the warm color of this room. It creates a cozy and enchanting space. 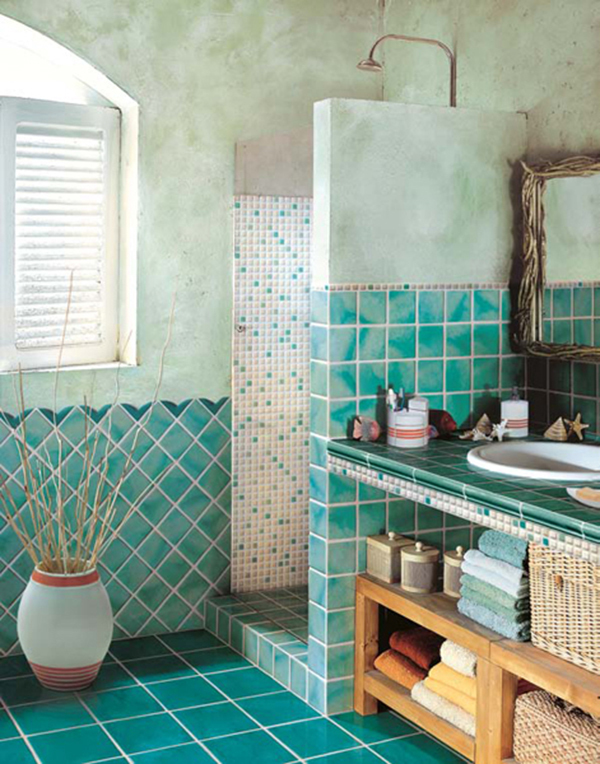 The teal color in this bathroom is absolutely gorgeous. The small tiles lining the sink are particularly intriguing. This sink tile could be our favorite so far. The white tile wall is stunning, and the tile design is creative and unique. There’s that wonderful tile and wood combination again, and the blue is gorgeous. Wow! These bathrooms are uniquely stunning. 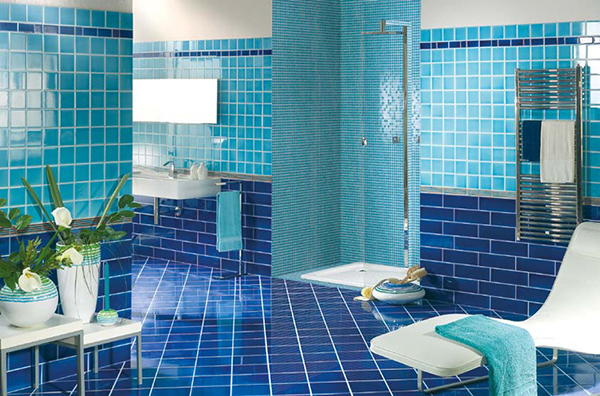 The use of the blues, and the barely there separation of the different spaces, creates a creative and distinct design. We also enjoy the shower tile in the second bathroom. 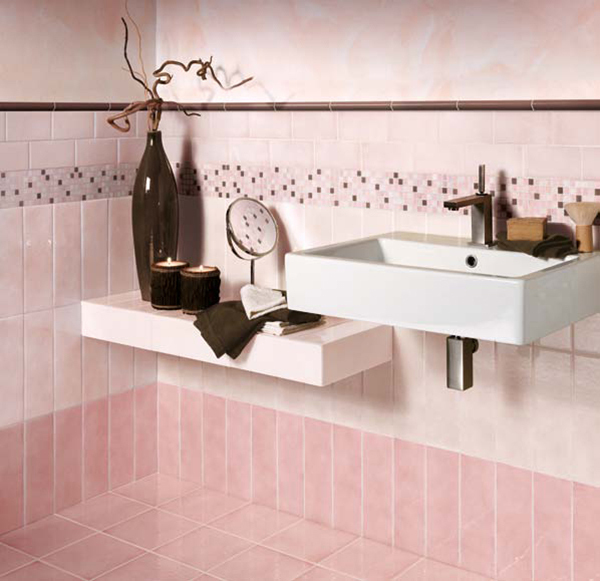 Pinks, browns, rectangles, squares, and patterns all come together in this space to create a cohesive bathroom. If you look really closely, you’ll see the pattern of the white tile used in the shower. Absolutely delightful. 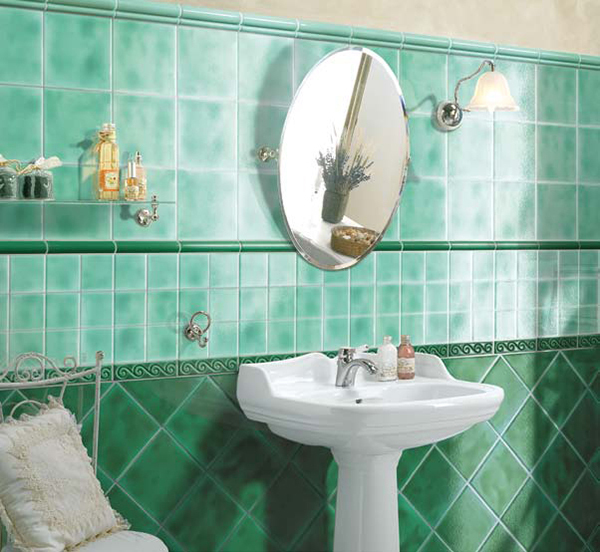 The small curvy design in this green bathroom adds a bit of elegance and old world charm. 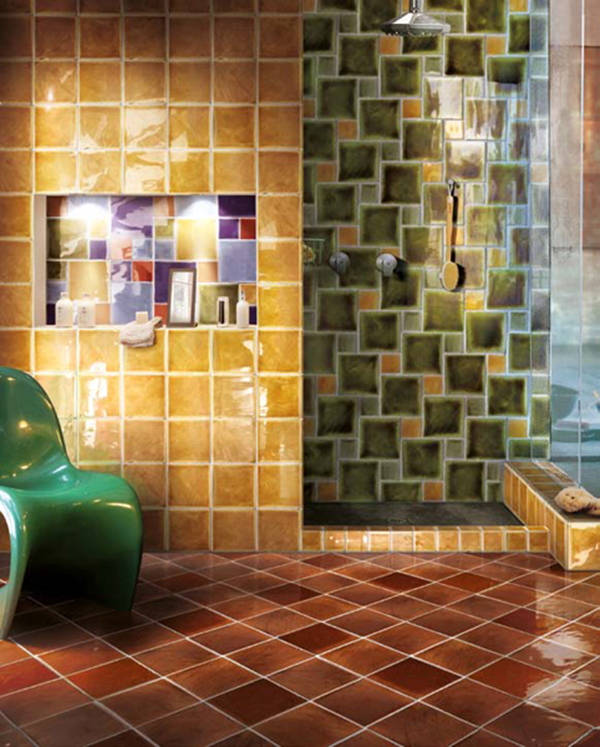 Bathroom tile ideas can be created through color, shape, size and design. You can choose to tile the wall, the floor, or just the sink. You can create a mosaic, use solid colors, or use multiple patterns. 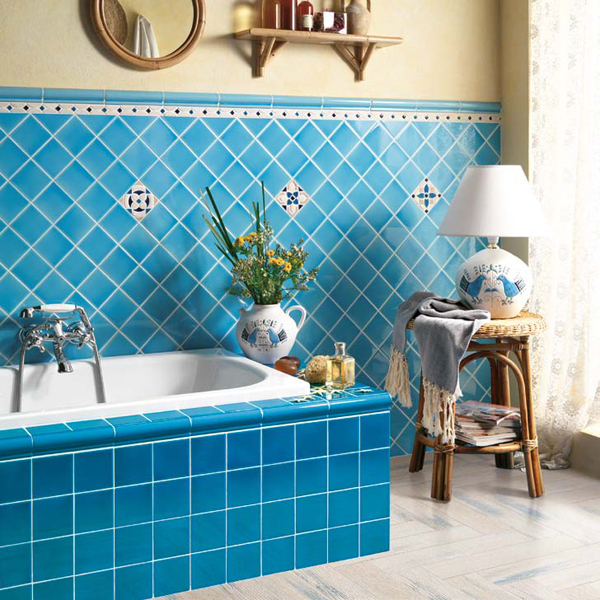 We’re partial to modern bathroom tile ideas, but you might love traditional, tropical, and/or bright and bold colors. Whatever your style choice, there is a bathroom design for you.